Stop Golden Rice! Defend our Farmers‘ Rights! remains the resounding call of Asia farmers‘ network against the impending commercialization of Golden Rice in Asia. Four years after the militant uprooting of Golden Rice, waves of protest mobilizations stir anew in the Philippines and Bangladesh against its commercialization, while debate rages on in Indonesia, India and other Asian countries where Golden Rice is planned for commercial release. Today, a protest campaign in front of Bangladesh Rice Research Institute (BRRI) was held by hundreds of farmers and civil society supporters led by the National Women Farmers and Workers Association (NWFA) and Bangladesh Agricultural Farm Labour Federation (BAFLF). A public forum on GMOs and Golden Rice was also held by NWFA and BAFLF few days back last August 4-5 in Gazipur to bring the public issue to the fore. The Golden Rice debate is marred by conflicts and controversy. After decades of research, the efficacy, safety and viability of Golden Rice remains uncertain and pose grave threat to food safety and consumers’ health. It is within this ground that government of China and academic journal publishers sanctioned and retracted the research work of scientists who engaged in unethical feeding of Golden Rice to children whose families were not informed that they were being fed Golden Rice last 2012. To date, there are no published reports proving that Golden Rice is safe for human consumption. Add to this the recent published study stating that Golden Rice is unfit for commercial cultivation due to poor agronomic performance leading to low yield. India host two-thirds of the world’s rice varieties. Campaigns in India have gained momentum against genetically engineered rice, including the Save our Rice network, the Folk Rice Movement and the Seed Mothers movement; all working to conserve and salvage thousands of traditional and indigenous seed varieties which would have otherwise been eroded by the onslaught of hybrid technology and conventional chemical inputs in the past decades. Recent news on the establishment of IRRI’s South Asia’s Regional Centre in city of Varanasi in the last quarter of 2017 have raised alarm as it may serve as a pretext to the government’s aggressive move to commercialize genetically engineered rice. The bitter tragedy hundred thousands of farmers succumbing to suicide in the past decade is linked with debt chains acquired from the seed monopoly of Monsanto thru BT Cotton in the cotton belt region remain to haunt the country. 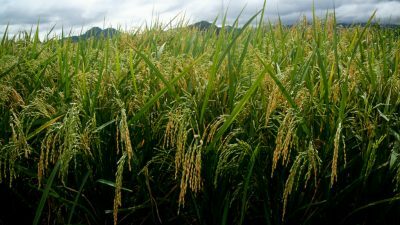 In Philippines, the Golden Rice issue was stirred anew with the renewed application for field trial and direct use last February 2017 despite the absence of public dialogue. To commemorate the historic uprooting and protest action against golden rice last August 8, 2013, hundreds of farmers will gather to hold a public forum in Nueva Ecija in Central Luzon, the rice granary of the country where Philippine Rice Research Insitute (PhilRICE) Golden Rice experimental fields are located. A civil society roundtable discussion on August 10 and a public dialogue between government and civil society will also be on August 11 within the national capital to re-echo public opposition against Golden Rice. “Golden Rice is a greedy scientific enterprise of IRRI and corporations masked as humanitarian aid. It deviates from the real solution to malnutrition which is to fight poverty, uphold genuine agrarian reform and promote diverse nutritious, natural and easily accessible food sources. Its ultimate interest is to secure top profit arena and monopoly control of global food system since billions rely, produce and consume rice. The looming Golden Rice commercialization anchored on neoliberal market will flood the region with massive and unregulated trade of GM rice. This spells doom to our country where the quantitative restriction on rice importation will soon be lifted. Golden rice is a death reaper to our local local rice sector as traditional rice varieties will be vulnerable to GMO contamination. Stop Golden Rice! is a call to defend life and freedom against this oppressive claws of corporate control,” stated Cristino Panerio, National Coordinator of the Magsasaka at Siyentipiko para sa Pag-unlad ng Agrikultura (MASIPAG), a local farmer-scientist movement in the forefront of campaigns against golden rice commercialization in the past decade. Since its inception in 2001, Syngenta (currently merged with ChemChina), Rockefeller Foundation, the Bill and Melinda Gates Foundation among others have poured millions of funds thru the International Rice Research Institute (IRRI) in the research and promotion of Golden Rice, a genetically engineered rice touted to address Vitamin A deficiency. But, strong and consistent peoples’ protests in the past decades impeded its planned commercialization particularly in Bangladesh, Philippines and India. In August 8, 2013, more than 400 farmers led the historic uprooting of Golden Rice experimental fields at Pili, Camarines Sur to signal strong opposition to Golden rice trials and commercialization. Corporate proponents thru their media mouthpieces, such as Mark Lynas and Patrick Moore, vilified the farmers’ direct action. The peasant movement in the Philippines, however, reiterated their dissent against Golden Rice as a legitimate conviction to defend rights against corporate control of agriculture thru GMOs. An Asia Farmers’ Conference against Golden Rice was subsequently held in 2014 with more than 70 farmers, people’s organizations from the region echoing their stand against Golden Rice. The campaigns proved successful as it triggered broader public attention, institutional debate and exposed the deceitful corporate claims on the Golden Rice issue in the national and international arena – ultimately leading to postponement of its commercialization.